Store your collectables, art supplies and other items in style with this durable, high quality oak 9-drawer chest that is made to impress and last throughout the years. GERSTNER INTERNATIONAL GI-T20 Oak 9-Drawer Top Chest If you want to have a stylish yet practical piece of furniture that will last you many years, this GI-T20 Oak 9-Drawer Top Chest is sure to be an ideal choice. It is an American chest with a classic style. This is made out of American hardwood of the red oak variety. It also has a plywood inner core and a red oak veneer. All of the outer Box parts are Oak veneer. The front lid rails are solid oak. The middle panel of the front lid is Oak veneer. The drawers are made of solid wood. The chest has different sized drawers, making it perfect to store various items such as coins, jewelry, precious tools and valuable items. You can store materials for a certain hobby, or use it as a moisture-free space in which to store your precision hand tools. If you have ever wanted furniture that includes multiple compartments, you are in luck. Place your craft materials, collectable and pocket knives, paints and art brushes and jewelry in a safe and sturdy chest that will keep everything organized for your convenience. With this chest, you have 3 drawers that are full width, and 6 that are half width. This allows you to have strategic placement of all of your most important items that you want stocked away for safe keeping, yet still have easy access to them. With an adjustable front lid, you will have good use of the space and can cover the nine drawers when it is locked. When you have it in the open position, you can stow the lid beneath the drawers. You also can remove the utility tray in order to move around and carry some of your tools that are regularly in use. 4.8 out of 5, Based on 7 Reviews. Great value for the money. Arrived quickly and in perfect condition. I purchased the 9 Drawer Top Chest for my husband's birthday. The staff kept me updated on its arrival and my husband loved it. I bought this chest for my husband. It is a nice looking chest and he loves it! I bought this for my husband... I chose this product over others for it's price, delivery schedule, and good reviews for service. It arrived in plenty of time and in good condition. My husband, who has always wanted a toolbox like this, loved it! This just arrived today. I've always admired and wanted a Gerstner box but never wanted to spend the $1000+. This is a beautiful, well-made box. I know its from China, but it fits the bill... and the price cannot be beat. Bought this tool box for my brother. Shipped in plenty of time..., great condition and helpful communication from Madison personnel. Thanks. Extremely well packaged-looks as if they are shipped from China, then inspected at Gerstner factory in Ohio,then drop shipped to your location, so any flaws should be caught. Well made, well finished; a few knobs were loose, easy to tighten. Drawer dividers and rubber feet DO NOT come with this model,so you'll need to order those from Gerstner direct. Top removable tray is a nice feature. 4.9 out of 5 Stars, Based on 13 Reviews. For storing and organizing a lot of craftsman tools (I build wood and plastic models) this is a great box. Not fine furniture, for sure, but sturdy and well made. The drawers are simple but operate well, and are a good size for the kind of small tools I need quick access to. Aesthetically, it sits on my workbench and reminds me to do good, careful work and take good care of my tools. Very much pleased with the quality received for the price. Madision shipped fast, packaged well. Would buy another one without hesitation. Gerstner International uses parts of lesser quality than the USA line but the actual boxes are about the same. I buy these to rebuild into fine furniture and usually don't keep much except the door hinges. The boxes are well made, though the felt is of inferior quality but can easily be replaced. For art supplies, tools, and just having a cool box, the International series is great. This one will be refinished in brass for my grandson's birthday (who knows what treasures must be protected from discovery when you're 11 years old!) Madison Art has THE best price on the web and the shipping, while slow to planet Nevada, is free. Thanks Madison Art, for a great deal and no hassles. MAdison Art consistently delivers quality merchandise at the lowest prices. 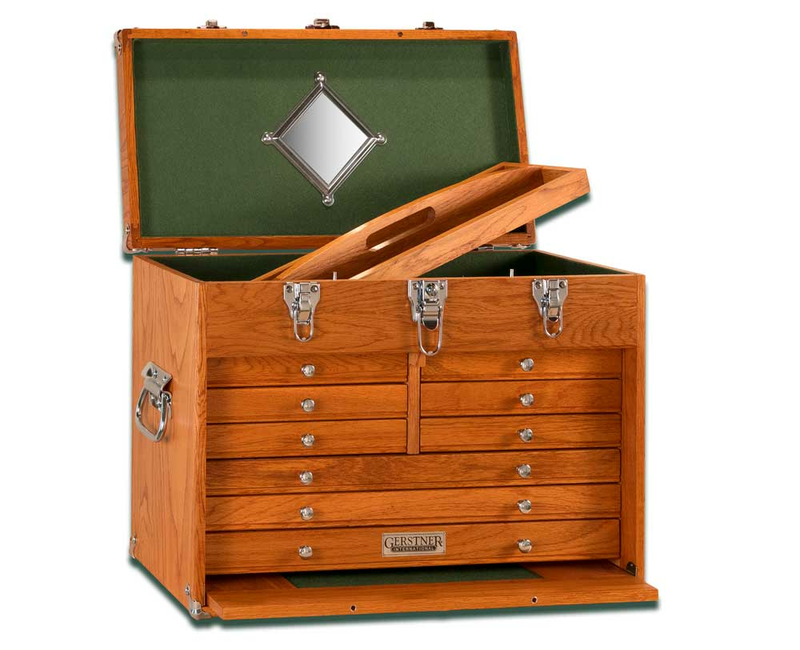 I ordered a Gerstner GI-530 chest from Madison Art. It was the lowest price I could find on-line, and was shipped free. It arrived very quickly and was in perfect condition. This is my second Gerstner chest order from Madison Art. My new GI-530 chest is beautiful ... solid and very well made. It's perfect for storing my watches and jewelry. I can't imagine using something so lovely for dirty old tools! Madison Art had the best price and offers free shipping! I am very pleased with this purchase. I ordered a Gerstner GI-530 chest from Madison Art. They have the best prices and reputation around! The chest arrived just as promised (with free shipping no less), packaged very well and in great condition.I am a fly fisherman and I store quite a bit of my fly tying stuff in the new chest. By the way, Orvis sells the same box for a significantly higher price - their's is over $80 higher! I highly recommend Madison Art. The quality of the chest is pretty good but bear in mind it IS made in China and there quality control is not the same as Gerstner USA. However it is still very well made,solid wood for less than half the price. Mine had one screw put in bent, that held on the corner protector. Rather than deal with customer service I fixed it myself. Also you will not find a better price for this anywhere else. It would have gotten five stars if not for that screw. Thank's Madison Art Shop !! !